This walk: 2016-3-23. Fernworthy Forest, Froggymead stone circle etc, blowing house, Teignhead Farm, Manga Farm, Starkey Memorial Stone, Royal Marine Memorial Stone. Previous walks in this area: 14th Dec. 2007 and 14th April 2008. The road in Fernworthy Forest, near the car park. Passing the stone rows and circle at Froggymead - a walking group seemed to be hiding behind the large stone! Teignhead Farm seen over the gate at the forest edge. The clapper bridge over the North Teign River with Teignhead Farm beyond. A view of a ruined wall of the blowing house. Small clapper over Great Mire Stream. Approaching Manga Farm ..... Click the image to see a larger version. 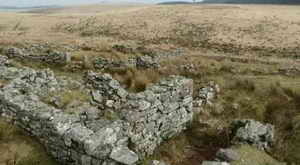 General view of the ruins - also known as Manga House or Mandles ..... this was a three-roomed house with a thatch roof. It was used as a squat in the 1980s, with tin roofing. A panorama of the ruins. A large trough in the floor? Drift lane leading to Manga Farm, known as Manga House Lane. The stone, at SX 64002 84640, with the simple cross barely discernible. It is inscribed FHS 1912-1989. It is seen better in the walk on 14th April 2008. Root ball of a wind-blown tree, this probably weighs a lot - even thos stones are heavy! W.O.1. (RSM), SL Perry, Royal Marines, 12.11.49 - 20.10.92. After leaving the memorial, access was gained into the forest through a small gate at SX 64675 84933, after which a walk of 100 metres on a bearing of 195� brings you to one of the main forest roads. The circle, rows and cairns at Froggymead in Fernworthy Forest. According to Butler, the circle dates from perhaps 4,000 years ago ..... there are 27 stones in the circle which is about 20 metres in diameter ..... there are altogether 5 cairns and three stone rows ..... one cairn and a double stone row are 140 metres to the north-ish. The stone circle seen from the east. The site is described in J. Butler (1991), Dartmoor Atlas of Antiquities II, The North. 35.15 Fernworthy stone circle, rows and cairns (figs. 35.7 & 35.8), pages 162-165. Double stone row 2, with the circle to the far left. 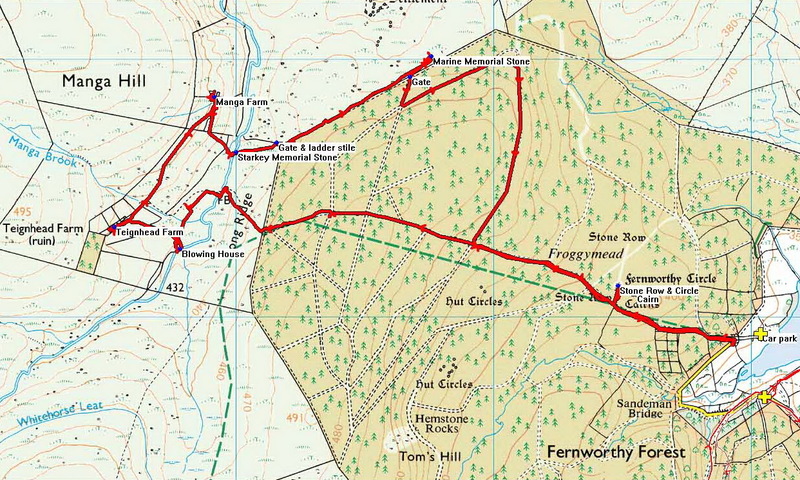 This walk was reached by driving to the far end of the road around Fernworthy Reservoir., parking at the yellow cross. Distance - 8.3 km / 5.16 miles.